The official website of the Los Angeles County Police Canine Association (http://www.lacpca.com) was hacked by CabinCr3w group of Hackers. 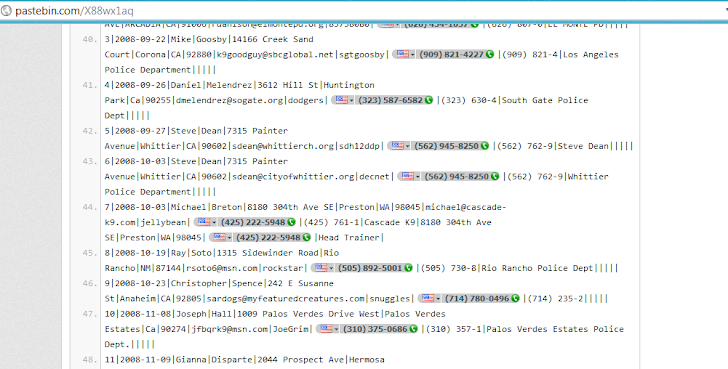 Hackers leak lots of data from the site on a Pastebin Note titled as "PedoCop & Police Emails". This data include officers names, addresses, and phone numbers of hundreds of officers and their membership rosters which were taken upon login. Hacker also upload two Archives which have the complete Google Emails data of two officers. Hackers also Mention that "we will not be including the photos from the email in this release but we will be making contact with the appropriate organizations protecting children from exploitation online."